Don't forget, ladies! Today is the 2nd Annual Day After Valentine's Day. I was babied beyond belief yesterday. Oh, how I love Azaleas! The day ended with us doing the dishes together, praying the Rosary, and reading Les Misérables aloud. Everything in between was ambrosial. But today it's our turn. No one is expecting the extravagant love to continue today. Do one profound act of babying your husband today. Iron his pillowcase, fluff his baked potato, meet him outside with a huge smile when he gets home, warm his blanket in the dryer... something simple, loving, and utterly gratuitous. Azaleas are native here, in fact, the "city" right across the river hosts a huge annual azalea festival each year. It's just slightly crazy. Will have to take some pics of ours when they bloom for you this year! On an unrelated, although Lenten note, I was looking for your recipes for falafel, tabbouleh and dolmas. I know you had pics up last year but I couldn't find them in the posts or recipes. All the recipes from last year I tried here were awesome (particularly the baba ghanoush). Oh, Kristen, please do send pictures! 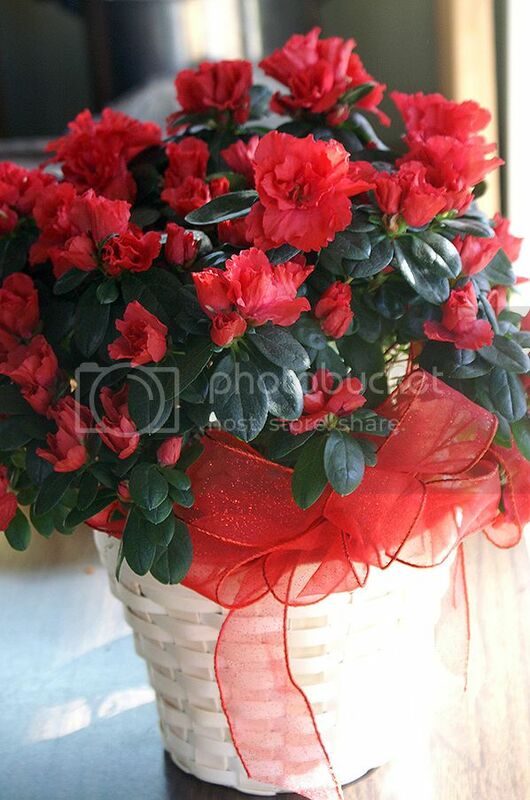 I've tried so hard to grow Azaleas in our climate and it just doesn't work :(... but the beautiful indoor bush will last for a good long while. You know, I don't think I ever got around (oops) to posting the recipes I used for those. I didn't like the tabbouleh that I made, but the falafel were AMAZING. I used this recipe at sooogood.org. I usually make dolmas on Fridays, so I don't put meat in them, but I LOVE a good meaty grape leaf. I think mint is what really makes them, so I usually just mix up a few cups of cooked cooled rice (brown or white) with the zest and juice of 2 lemons, a large handful of chopped parsley, a small handful of chopped mint, a 1/4 cup or so of raisins, (on rare occasions I'll throw in some pine nuts, too), several glugs of olive oil, a tablespoon of black pepper, salt to taste and a few minced garlic cloves. Mix well and stuff a tablespoon or two into each grape leaf. HOLY YUM, Batman! I think I know what I'm making tonight :). Glad the baba ghanoush turned out! I bought two eggplants yesterday for that exact project :). What lovely ideas, Sonja! Loving marriages make my heart happy. I didn't exclude unmarried ladies because they couldn't/shouldn't participate... merely because they rarely need reminders to be affectionate :-D.
Seedling Success! But... Help!! Now What?